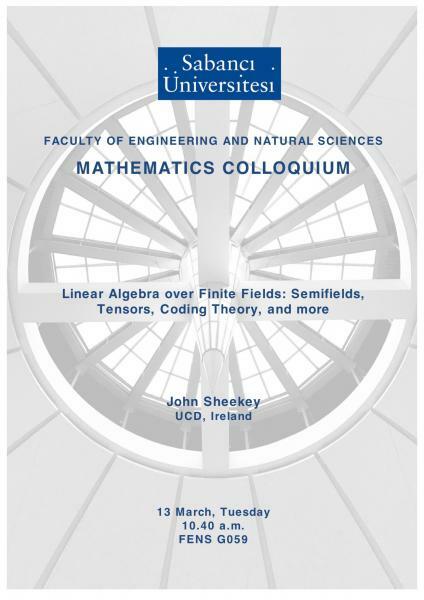 You are cordially invited to attend the colloquium given by John Sheekey (UCD, Ireland) on Tuesday, 13 March 2018, in FENS-G059 at 10.40 am. Abstract: Problems related to subspaces of matrices over a finite field, in which the rank of elements is restricted in some way, arise inmaycontexts in algebra, geometry, and coding theory. In thistalk we will give an overview of these problems. We will present the state-of-the-art, including recent results, ongoing projects, and potential future directions. Particular focus will be on finite semifields (finite nonassociative division algebras), classifications of tensors over finite fields, and rank-metric coding, as well as related problems in finite geometry.